was born into the ranks of the Parisian bourgeoisie on January 29. His Mother, Eugenie-Desiree Fournier, was a woman of refinement and god daughter of Charles Bernadotte, the Crown Prince of Sweden. 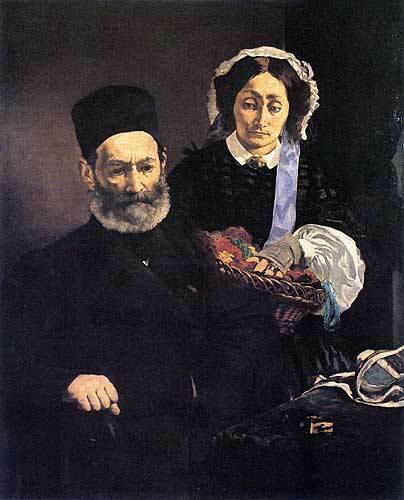 Edouard's father, Auguste Manet, was a magistrate and judge. after serving in the merchant marines, Manet entered the studio of Thomas Couture where he studied until 1856. He was influenced by the old masters, particulary Velazquez, Goya and also Titian, Tintoretto, Veronese and Giorgione. He met Baudelaire and began his career with The Absinthe Drinker (6th picture in the exhibition), a painting depicting a debauched and solitary man amongst the shadows of the back streets of Paris. painted Spanish Guitar Player (7th picture in the exhibition), reflected the Parisian love of "all things Spanish" and was one of Manet's first works to be accepted by the Salon. 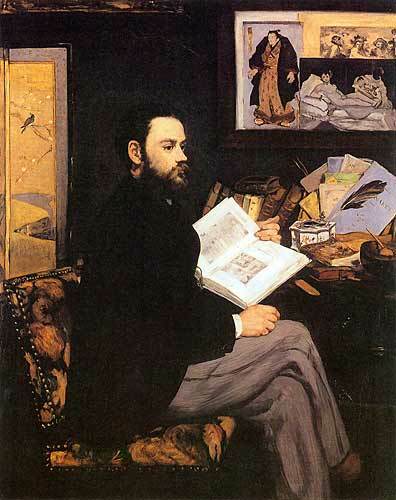 İn the same year he painted the Old Musician, portray a darker aspect of Parisian life which was quite removed from Manet's circle, but nonetheless very real. Music in the Tuileries (9th picture in the exhibition list) peopled with Manet's friends and family celebrates fashionable society. 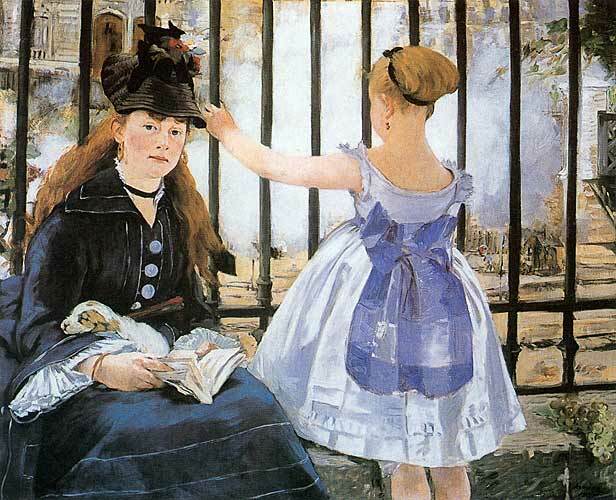 Manet put great emphasis on Salon acceptance. In fact, he believed that success as an artist could only be obtained through recognition at the Salon. 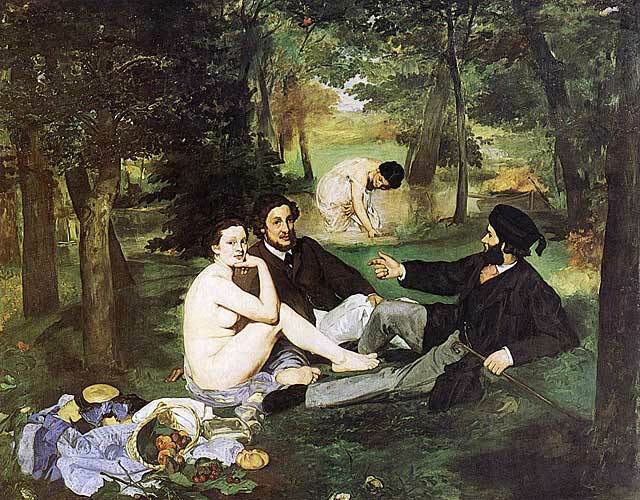 But, the Salon jury of 1863 refused Luncheon on the Grass (8th picture in the exhibition). To counter these refusals, the Salon des Refuses was established and Luncheon on the Grass was exhibited there. He also painted Olympia (13th picture in the exhibition) this year and created a scandal. 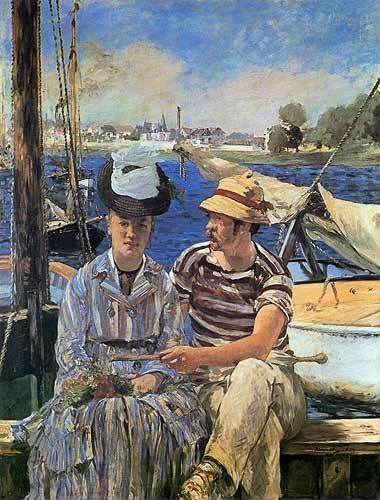 Zola published a longer article on Manet, who that year exhibited his work in an independent pavilion at the Paris World's Fair. Manet painted The Execution of Maximilian (15th picture in the exhibition) reaches out to Goya's Third of May but despite its masterly influence the painting was banned from being exhibited in Paris due to the "Frenchness" of the executioners costume. Political events between the years 1867-1871 were turbulent ones for Paris, and the Franco-Prussian war left Paris besieged and defeated. 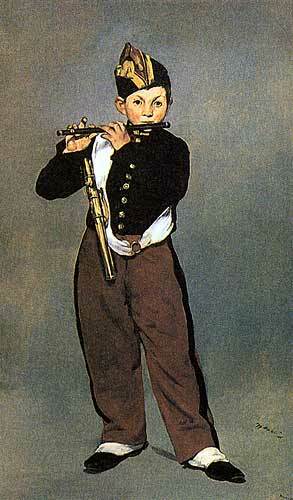 Manet sent his family south to protect them from the fighting in Paris and signed on as a gunner in the National Guard. The dealer Paul Durand-Ruel began buying his work. He could hardly paint because of his ilness. 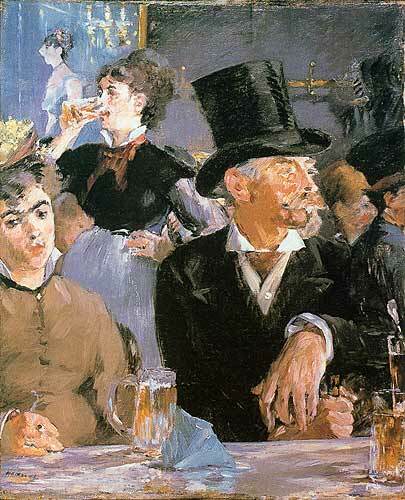 From 1879 to 1882 Manet participated annually at the Salon. 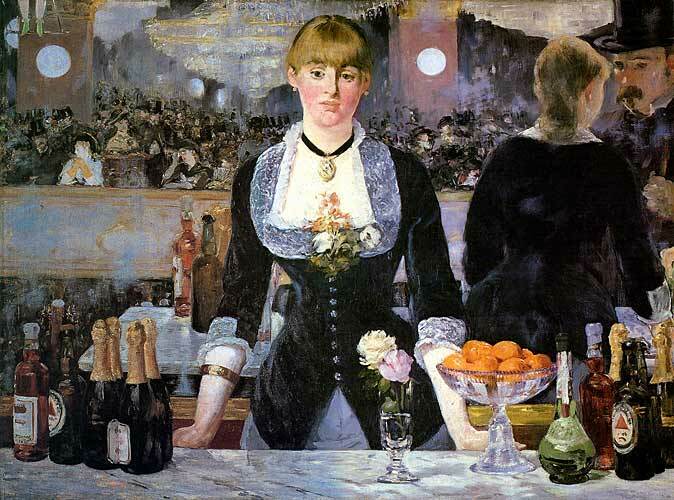 In his last great masterpiece, Bar at the Folies-Bergère (38th picture in the exhibition), Manet returns again to studio painting. He was decorated with the Légion d'Honneur. A memorial exhibition of his work took place at the Ecole des Beaux-Art. How I miss you here and how happy it would have made you to see Velasquez who all by himself makes the journey worthwhile; the artists of all the other schools around him in the museum at Madrid, who are extremely well representyed, all look like shams. He is the supreme artist; he did not surprise me, he enchanted me. The full-length portrait we have in the Louvre is not from his hand. Only the Infanta is indisputable. There is a huge painting here, full of little figures like those in the Louvre picture called the Cavaliers, but with figures of women as well as men, perhaps of higher quality and above all completely unrestored. The landscape in the background is by a pupil of Velasquez. The most extraordinary piece in this splendid oeuvre and possibly the most extraordinary piece of painting that has ever been done is the picture described in thr catalogue as a portrait of a famous actor at the time of Philip IV; the background disappears, there's nothing but air surrounding the fellow, who is all in black and appears alive; and the Spinners, the fine portrait of Alonso Cano; las Meninas (the dwarfs)(sic), another extraordinary picture; the philosophers, both amazing pieces; all the dwarfs, one in particular seen sitting full face with his hands on his hips, a choice picture for a true connoisseur; his magnificient portraits- one would have to go through them all, they are all masterpieces; a portrait of Charles V by Titian, which is highly regarded and which I'm sure I would have admired anywhere else, seems wooden to me here. (A lesson in still-life painting for Eva Gonzales) Get it down quickly. Don't worry about the background. Just go for the tonal values. You see? When you look at it, and above all when you think how to render it as you see it, that is, in such a way that it makes the same impresssion on the viewer as it does on you, you don't look for, you don't see the lines on the paper over there do you? And then, when you look at the whole thing, you don't try to count the scales on the salmon. Of course not. You see them as little silver pearls against grey and pink - isn't that right? - look at the pink of this salmon, with the bone appearing white in the centre and than greys like shades of mother of pearl! (On the encounter with Toché at Café Florian) I can see you're a Frenchmen… Heavens, how boring it is here! (On a motif for a picture near the Salute) I'll put in a gondola with a gondolier wearing a pink shirt and an orange scarf, one of those handsome fellows, as dark as a Moor. … It's the most difficult thing, to give the impression that a hat is sitting properly on the model's head, or that a boat has been constructed from planks cut and fitted according to the rules of geometry. (On planning a picture of the regatta at Mestre) When faced with such a distractingly complicated scene, I must first of all choose a typical incident and define my picture, as if I could see it framed. In this case, the most striking features are the masts with their flittering, multicoloured banners, the red-white-and-green Italian flag, the dark, swaying line of boats crowded with spectators, and the gondolas like black and white arrows shooting away from horizon; then, at the top of the picture, the watery horizon, the marked target and the islands in the distant haze. I would first try to work out logically the differen values, in thir nearer or more distant relationships, according to spatial and aerial perspective. The lagoon mirrors the sky, and at the same time acts as a great stage for the boats and their passengers, the masts, the banners, etc. It has its own particular colour, the nuances it borrows from the sky, the clouds, from crowds, from objects reflected in the water. There can be no sharp definition, no linear structure in something that is all movement; only tonal values which, if correctly observed, will constitute its true volume, its essential, underlying design. The gondolas and other boats, with their generally dark colours and reflections, provide a base on which to set my watery stage. The figures, seated or in action, dressed in dark colours or brilliantly vivid materials, with their parasols, handkerchiefs and hats, appear as crenellated forms of differing tonal values, providing the necessary repoussoir and defining the specific character of the areas of water and gondolas that I can see through them. Crowds, rowers, flags and masts must be sketched in with a mosaic of coloured tones, in an attempt to convey the fleetingly quality of gestures, the fluttering flags, the swaying masts. On the horizon, right at the top, are the islands. There should be no more than a suggestion of the most distant planes, veiled in the subtlest, most accurately observed tints. Finally the sky should cover and envelope the whole scene, like an immense, shining canopy whose light plays over all the figures and objects. The brushstrokes must be spontaneous and direct. No tricks, you have to pray to the God of all good, honest artists to come to your aid! (On Veronese's Triumph of Venice in the Palazzo Ducale) It leves me cold! Such wasted effort, such empty expanses! No emotion whatsoever! I love the Carpaccios with their naive charm like illuminated books of hours. And… the Titians and Tintorettos in the Scuola di San Rocco are imcomparable…But in the end, you see, I always come back to Velasquez and Goya! An artist must be a 'spontaneist'. That is the proper term. But in order to achieve spontaneity, you must muster your art. Trial and error won't get you anywhere. You must translate what you feel, but your translation must be instanteous, so to speak. One talks of l'esprit de escalier, or taking a belated step with a witty retort. No one has ever talked of l'escalier de l'esprit, or the steps that lead to wit and wisdom. Yet so many people try to climb them and never succeed in reaching the top, given the difficulty of getting there at a single bound. The fact is, you always find that what you did yesterday is no longer in harmony with what you are doing today. If Bacon's definition, that art is man added to nature, homo additus naturae, is an absolute truth, you still have to be sure that nature is what you've got. Even the most faithful memory is no substitute. (On colour and line) …without punctuation there can be no spelling nor grammar, and its absurd to try and distinguish between colour and line. …It's true I don't draw the sort of stupid lines one is taught at the Ecole (des Beaux- Arts). But just ask the illustrious professors who teach there to sketch in a picture with a feeling for light in their fingertips. I defy them to do it. There is such a radiance and mobility in the atmosphere that envelops everything in its dazzling splendor! Try telling that to people who pin a figure on a canvas as one pins a butterfly in a display case.